Some early mornings make Vancouver seem like the most magical place on earth. There’s always that moment when the morning mist is dissipating and the day is brightening and everything seems unthreatening and conquerable. The edges of the scene are busy with industrial, residential, and commercial points of architecture. On the left are the bright, bird-like Port of Vancouver cranes and the crisp points of the Pan Pacific bunched up alongside the exaggerated towers of downtown. On the right are the industrial cargo terminals and the ever-present sulphur piles. The center is calm and peaceful, with one lone, ubiquitous red-bottomed cargo freighter waiting to load. Vancouver is an active city with a lot of industry. 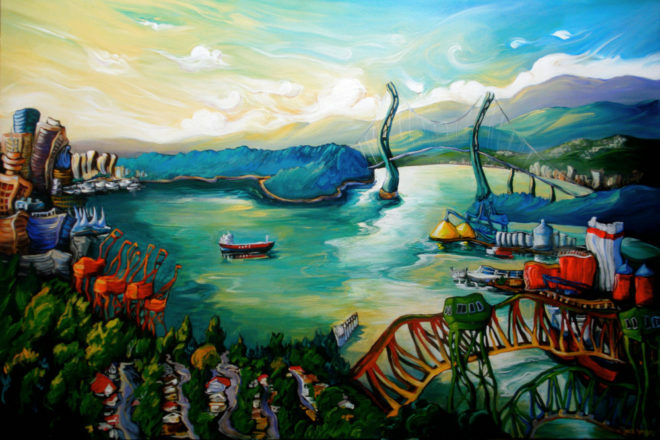 This scene is a visual pathway through the busy-ness of all that industry and commerce towards a more serene place. There may be fistfuls of clouds on the horizon and bridges to cross eventually, but not now. The essence of this scene is how one can always find a calm center even when surrounded by activity.